Pig louse (pig lice) that can be treated with Ivermectin. Pig lice shown on a pig. These parasites are usually visible to the naked eye. Fleas: While fleas are not common on adult healthy pigs because the skin is too tough to bite through, they can infest young piglets and hitch a ride if other pets in the environment have fleas. Advantix, Advantage and Frontline (labeled for dogs) are safe for pigs if you follow the weight dosing. You can buy these from your veterinarian according to the weight of your pig. Sarcoptic: Most common type and caused by the mite S. scabiei var.sis. The 1st skin lesions appear about 3 weeks after contact with the mites as small encrustations around the ears, eyes, snout that develop in plaques about 5mm in diameter. The lesions in the ear may regress and disappear in 12-18 weeks. Early pruritus (itchiness) is due to the local irritation from the mites establishing themselves in the skin. As the ear lesions regress, focal erythematous papules associated with the hypersensitivity occur on the rump, flank and abdomen. 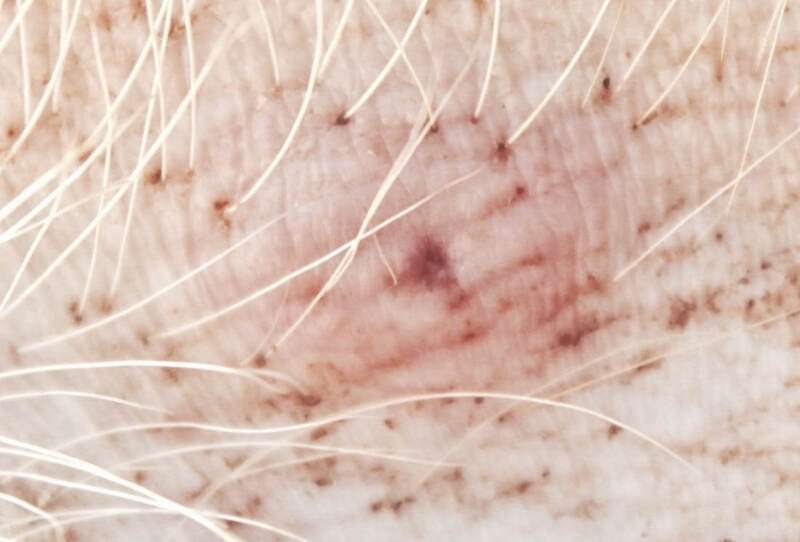 Mites are NOT usually found in these lesions. The hypersensitivity causes further pruritus, which results in excessive rubbing and the liberation of tissue fluids, giving the animal a shiny or "greasy" appearance. That is followed by coagulation and drying of the serum and sebum to form crusts. In more chronic cases, excessive keratinization and proliferation of the connective tissue occur, with the result that the skin becomes thickened and wrinkled. A common sign is head shaking and the development of large hematoma on the inner surface of the ear. Demodectic: Caused by Demodex phylloides which live in the hair follicle or sebaceous glands the skin. Clinical signs are seen when pigs are in poor or debilitated conditions normally. These mites usually invade the soft skin of the snout and around the eyes but can spread across the entire body. Infection is not uncommon on the abdomen and between the legs. Lesions start as small red spots that become scaly with a nodular appearance. The nodules contain white caseous material and many mites. 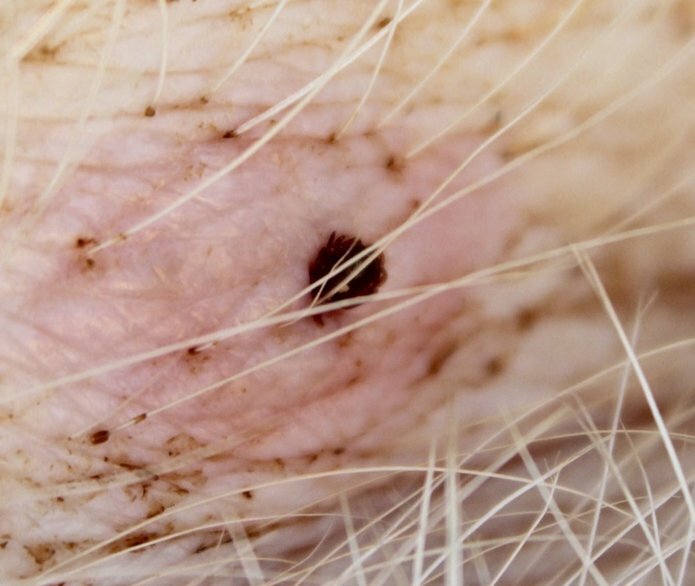 Mites cane found on skin scrapings from around the eyes in pigs showing no clinical signs. Treatment can be difficult and sometimes several affected animals cannot be successfully treated. Scabies is found worldwide and affects people of all races and social classes. Scabies can spread rapidly under crowded conditions where close body and skin contact is frequent. Institutions such as nursing homes, extended-care facilities, and prisons are often sites of scabies outbreaks. Child care facilities also are a common site of scabies infestations. This is NOT the same mite that affects pigs. The mite is able to survive 21 days off the host in ideal situations. The warmer and drier the conditions the shorter the survival time.The pig mange mite does not live in or on other hosts." ​"Sarcoptic mange mites are very small (0.45 mm long) and can be seen only under microscope. There are species-specific strains that attack cattle, sheep, goats and also humans. As a general rule, pig mange mites are not contagious for cattle, sheep, or humans, and vice-versa." 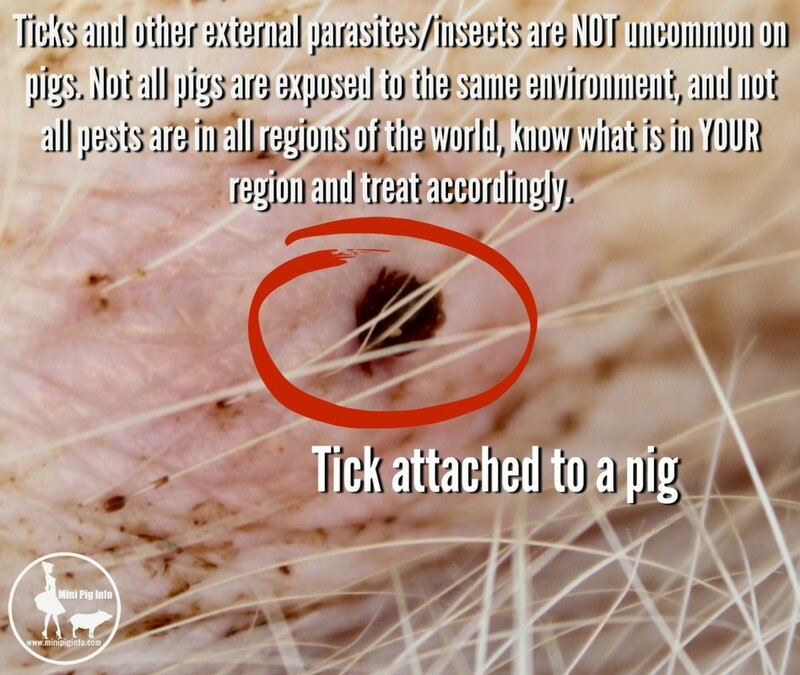 Ticks are practically everywhere in the US and often found on mini pigs. There are several products that you can use in your yard to reduce the number of ticks. Tick Warriors is our favorite all natural, "pet-safe" product that is so safe, you can use the spray directly on your pig. University of Florida has reported a new potentially life threatening rat lungworm June 2017. ​Infection with rat lungworm can also cause meningitis in animals, as well as limb weakness or paralysis, neck pain and central nervous system problems. To protect pets and livestock, be mindful of snails in animals’ living space, Stockdale Walden said. Check watering troughs for snails that might have fallen in and monitor animals for snail-eating habits. Read article in its' entirety by clicking here. 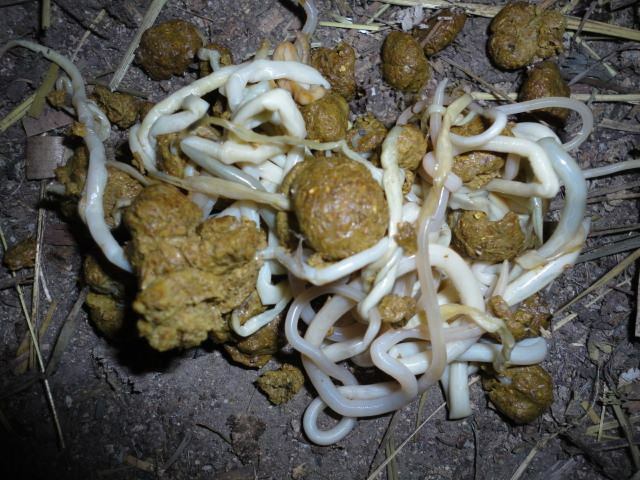 Kidney Worms cause an unthrifty appearance, slow growth, poor feed conversion and occasionally death. Lung Worms live in the air passages and can lead to an infection of the lower respiratory tract, usually resulting in bronchitis or pneumonia. Pigs with many lungworms are unthrifty, have a rough hair coat, and are small for their age. This is a tick attached to a pig. Pigs CAN get tick and flea bites. 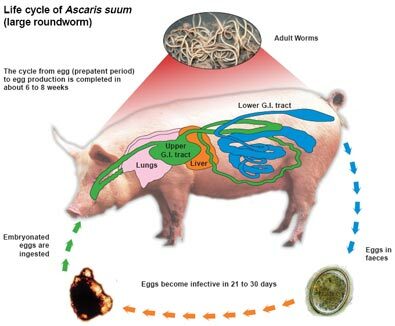 Worm infestation in a pig. This is an example of internal parasites. These "pests" can be found in pretty much any area of the county and the seem to be coming out earlier and earlier. Should you detect a tick on your pig, it should be removed immediately. Lyme's Disease CAN be passed on to pigs. Below are pictures a friend sent asking what the problem could be. 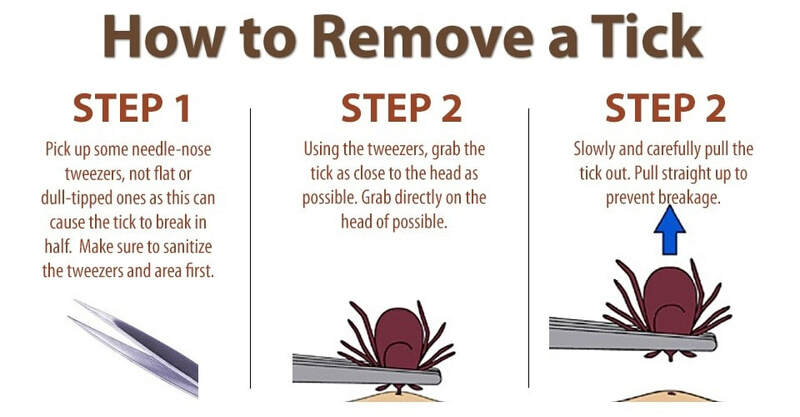 Being from a tick infested area myself, I knew what the problem was almost immediately. Frontline Advanced or Advantage Plus can be safely used in pigs...you MUST pay attention to the weight restrictions though. Do NOT use ANY product on your pig without first checking with YOUR vet. The ticks below are "seed ticks" which are essentially baby ticks. They're barely visible to the naked eye, so you have to look for other clues that your pig may have a small tick infestation. Once treated, this particular pig did great. Come to find out, they were staying, literally, on a tick nest. It took quite a few days and proactively treating for anymore before he recovered. Click here to read more about ticks and how to control them in your yard. Seed ticks after being removed from a pig. ​How ticks spread disease. 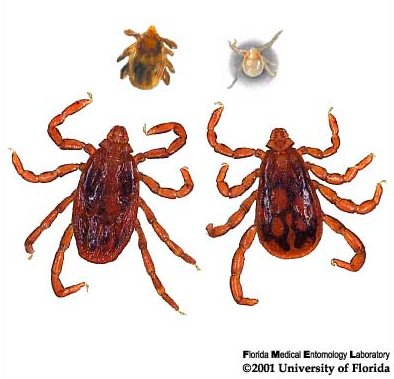 Ticks transmit pathogens that cause disease through the process of feeding. It is likely unknown if all tickborne diseases can affect pigs, but using the theory that a pig closely resembles a human as far as internal structure/organs, my guess would be that pigs could potentially contract any of the tickborne diseases that affect humans. It is always better to be safe than sorry. A female tick can lay 3000-4000 eggs at a time after a blood meal. This is what you may see in the yard or on a surface. 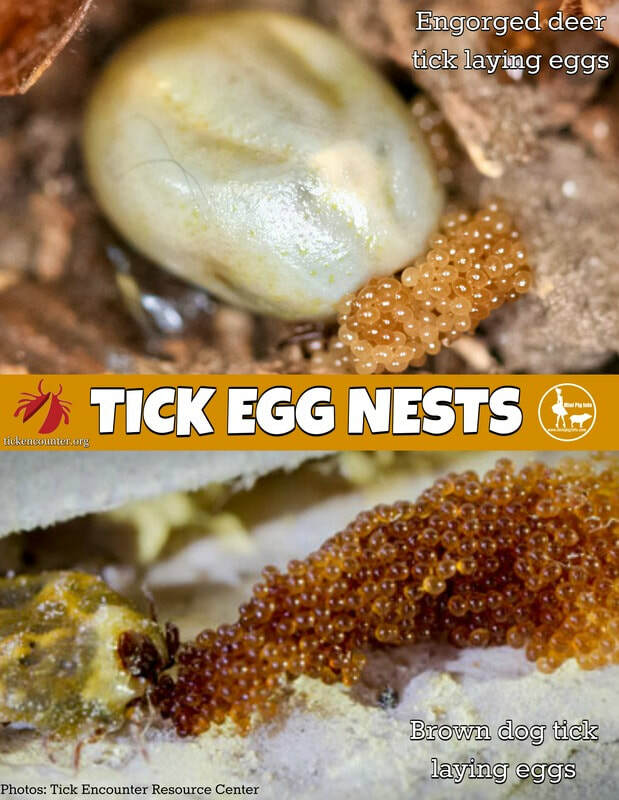 These are tick eggs or nests and they will hatch and this vicious cycle repeats over and over and over again. Another great resource is the tick encounter resource center which has a FAQ section that can help you determine what parts of your yard may need work to lessen the amount of ticks living there. Seed tick infestation on a pig. A pig presented with bumps under the front two legs, normal washing began along with hydrocortisone cream. After a day, it was determined that seed ticks were the cause as shown on the last picture on a white cloth. Furthermore, the nest was discovered nearby and this particular pig was laying in that area day after day, so until it was identified and destroyed, each tick had to be removed night after night. Just one example of how these tiny ticks might present on a pig. Preventing ticks on your pig. ​Tick bites on pigs may be hard to detect. Signs of tickborne disease may not appear for 7-21 days or longer after a tick bite, so watch your pig closely for changes in behavior or appetite if you suspect that your pig has been bitten by a tick. I do a routine tick check every single day for my pig. Its a good habit to add to your routine since having a cooperative pig can help detect ticks that may have not even attached themselves yet. If you cannot prevent them altogether, the next best thing is to have the ability to remove them as soon as possible.